According to the Human Comics web site, “Gabriel Smith is a screenwriter from Venice Beach, California. 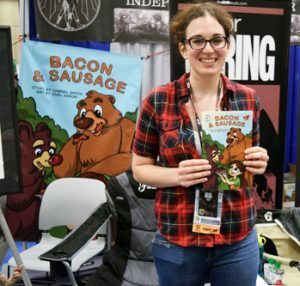 He is the founder of Human Comics, an independent comic book publisher, which was created as a platform for Smith to exhibit his writings for a cyberpunk sci-fi series entitled Human (aka Anthropocene: The Human Saga).” More recently though, Gabriel created a “children’s comedy comic” called Bacon & Sausage, illustrated in full color by Sara Varon. Well he describes it as a children’s comic — but it does seem to have a lotta harsh language and even, um, “body humor” for kids! Oh well, modern kids, it looks like!